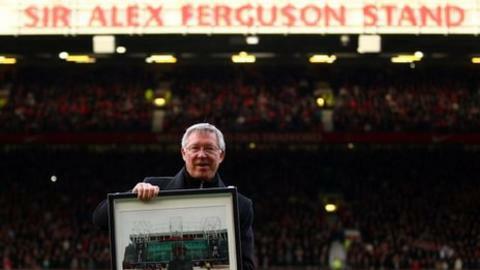 Manchester United have renamed the North Stand at Old Trafford the Sir Alex Ferguson Stand in recognition of his 25 years as manager of the club. Ferguson was given a guard of honour by his own players and visitors Sunderland as he made his way on to the pitch for Saturday's Premier League game. The club also announced that a statue of the Scot would go outside the stand before the start of next season. Ferguson, 69, succeeded Ron Atkinson as United manager on 6 November 1986. Chief executive David Gill announced that the stand was to be named in Ferguson's honour on the pitch before the match against Sunderland, which United won 1-0 thanks to an own goal from their former defender Wes Brown. Following a standing ovation from the crowd, the manager declared his pride at working for "the best club in the world". After the match Ferguson said he was honoured to have had the stand named after him. "It was a surprise for me today, I didn't expect that," he told BBC Sport. "I felt really honoured and emotional when I saw my name on that stand. I must say thank you to the club for that. My assistant didn't tell me - so he's sacked!" When asked for the most memorable moment of his 25 years in charge, Ferguson said: "I'll never forget Barcelona . Never."